* A dynamic and unique cocktail hour will feature an art installation for auction by 7 of DC’s notable artists, as well as a live art showcase. *Well known fashion designer, LELA ROSE will showcase her Spring 2010 Collection in an exclusive NY style runway show! *Celebrity hairstylist, Ted Gibson and his team will be the hairstyling team backstage providing the beautiful looks inspired by Lela’s Spring collection. Labels for Love, Inc. benefits 501(c)3 charitable organizations that protect women and children from the damaging effects of poverty, homelessness, political unrest, abuse, and the hardships associated with terminal illnesses. One children’s charity and one women’s charity is chosen to benefit from event proceeds, per calendar year. While the core of our efforts are geared toward solutions-focused organizations in the Washington, DC Metropolitan area, we also lend our support to national organizations who share in our passion and vision to make a difference. 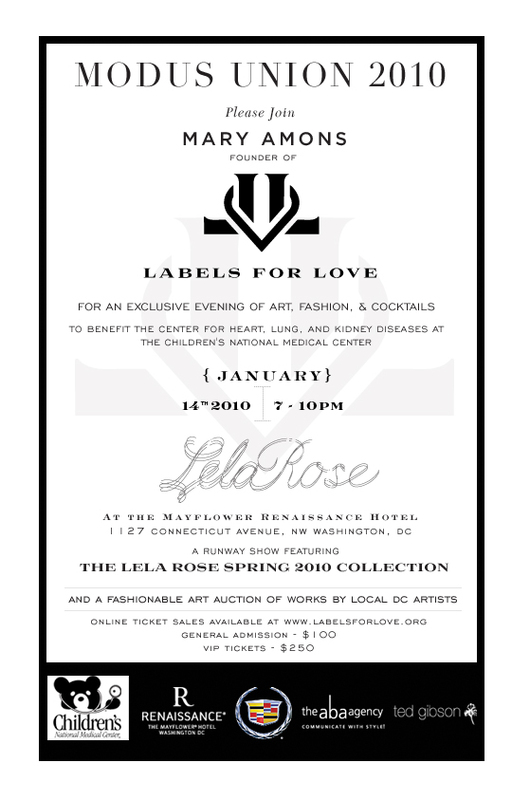 Mary Schmidt Amons founded Labels for Love, Inc. in 2006, to produce fashionable events to raise funds and awareness for the foundation’s chosen causes. A mother of five, Mary has developed a heartfelt passion for making a difference in the lives of women and children, in need. She is motivated to influence her children to be charitable, continuing her family legacy of being philanthropic. As a former handbag and accessories designer, Mary has a deep knowledge of the fashion industry, as well as experience in event planning and public relations. The granddaughter of entertainer Arthur Godfrey, Mary has been inspired to continue his legacy of philanthropy for generations to come. Mary served as the Executive Director of the Vincent T. Lombardi Foundation, Inc.,established to benefit the Vincent T. Lombardi Cancer Research Center at Georgetown University. The foundation was established by her father, Robert L. Schmidt, and has raised millions for cancer research, since its founding in 1971. Mary witnessed her father’s impact on the community with his influence and time, which has served also served as inspiration to make a charitable impact on the community. Along with her team of dedicated volunteers, and support from her family, Mary is committed to using her creative talents to conceptualize and produce events that will collectively unite those within the fashion, design, corporate, political, celebrity, social and philanthropic communities, to raise funds and awareness for a variety of worthy causes that provide assistance and long-term solutions to those in need.